Vipera kaznakovi is a stoutly built venomous viper species. 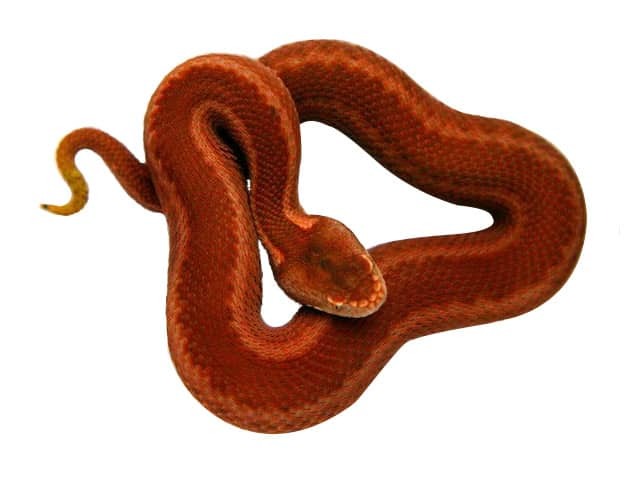 Unlike other species of vipers of this complex, red and orange tones prevail in colouration. There are wide, zigzag-looking strip of black or dark-brown color on the upper side of the body. Very often dark spots on sides of a body also merge in a continuous strip. The upper side of the head is black, a belly is black without spots. Young individuals have bright red-brown colouration, back strip and patterns are similar to adults and reaches its maximal intensity after the first wintering. For housing I recommend a plastic box of minimum dimensions 0.3 x 0.15 x 0.1 meters (1 x 0.5 x 0.3 feet) for juveniles and minimum 0.3 x 0.6 x 0.2 meters (feet) enclosure for adults with good ventilation. Of course as always the bigger the better as long as you can keep the thermal gradients and have hide spots in the terrarium. Keep you vipers ALWAYS separately (because of cannibalism and damaging each other during feeding). You should house your pairs together only during mating for few hours. I recommend two cork pieces as hiding places. You should place the one in the warm area and one in the cold. In this way your snake can thermo-regulate and feel secure at the same time. I use aspen or bark chips with depth of 0.03-0.04 meters (0.10-0.12 feet). You can additionally add some leafs on top. I provide 12 hours per day lighting during summer and 8 hours a day during winter (before and after hibernation). The cold side temperatures should be between 16-18 °C (60-64 °F) during day time and the a warm side should range 30-45 °C (86-115 °F) with a hot spot around 40-45 °C (105-115 °F). A night temperature drop between 16-18 °C (60-64 °F) is recommended. For 3-5 months during winter, I place my snakes into smaller boxes with paper pieces to hide, low humidity, small water bowl and temperatures of 4-6 °C (39-43 °F). I don’t make quick temperature changes, max 2 °C (4°F) per day. Clean fresh water should always be provided in a low, heavy bowl on the cool side of the enclosure. Vipera kaznakovi should be kept at a 50-70% humidity. You should increase humidity with spraying the enclosure only during the week before shedding. I feed my juvenile Vipera kaznakovi mice pinkies, lizards, grasshoppers/crickets. I scent pinkies with lizard blood to make them start feeding on rodents. Keep juveniles ALWAYS separately! I feed my adults rodents, lizards and small birds if possible. Stop feeding your snakes minimum 1 week before reducing temperatures for hibernation, ideally 2 weeks before temperature is reduced to minimal 4-6 °C (39-43 °F). Like every venomous snake, you have to be careful. Because of the small size of Vipera kaznakovi, you can handle them without any problems with one hook. You should avoid handling your Vipera kaznakovi oftenly. Reasoning for handling should be for health checks or when cleaning the enclosure. Spot cleaning should be done weekly and full substrate changes done every couple months. At that time the enclosure should also be wiped down with a safe disinfectant. You should move your snake into a large garbage can with a lockable lid when you clean your enclosure. Under the proper conditions, shedding for this species will go fine. They rarely ever have shedding issues if the humidity of the enclosure is at proper levels. There is no shedding during hibernation. No specific potential health problems to mention for this species beyond those affecting reptiles and/or snakes in general. They seem to be a relatively hardy animal when kept properly.